Feeling like you might lose it if you get one more Black Friday or Cyber Monday email? I'm with you! But I DO have a few Cyber Monday specials for you and one is free so I couldn't resist creating a Cyber Monday Special podcast episode for you. 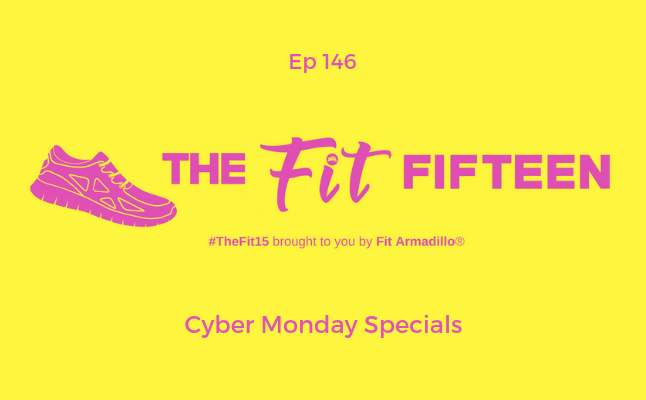 Tune in for some of my favorite books for the fitness lovers on your gift list this holiday season, products I love that are on sale today, as well as three special offers you can take advantage of from my fitness company, Fit Armadillo. Finally, I invite you to become a supporter of The Fit Fifteen and share something special for the 1st five supporters who pledge at least $25. No episode from the creator yet, but I use and recommend the charcoal cleanser, toner, and moisturizer (HERE) on sale today! 1. FREE copy of my book HERE Nov. 26 and Nov. 27 2018. Signed copies available HERE and 1st 5 to pledge $25 or more in support of the podcast! 2. Want help with your running? Podcast host and personal trainer, Catherine Basu, will be offering more running coaching programs in 2019. Get on the email list for updates HERE. 3. Check out bundles of fitness products and our private online personal training and yoga sessions HERE. 4. The Drop 2 Sizes Fitness Challenge will be coming back this January. Save your spot (space is limited to ten) HERE for $200 off when you register by Nov. 30th.